Ah, the wonderful world of parenting! Parenting comes with its own set of special fails, laughs, punishments, and other ridiculous moments. 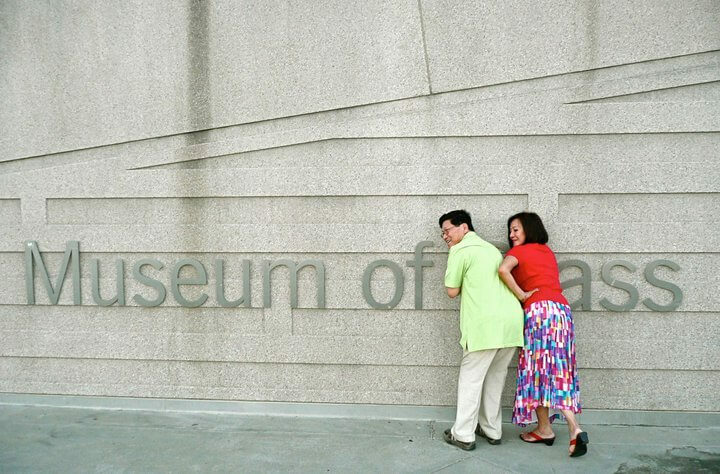 Check out this list of the most epic parenting fails, mocking moments and punishments! Many of these went viral. In 2015, the hashtag #pooldiaperbutt when viral and parents everywhere were having a laugh at their child’s water logged diaper. While they do sell special diapers that are intended just for swimming nowadays, sometimes a parent can just forget to switch them out. 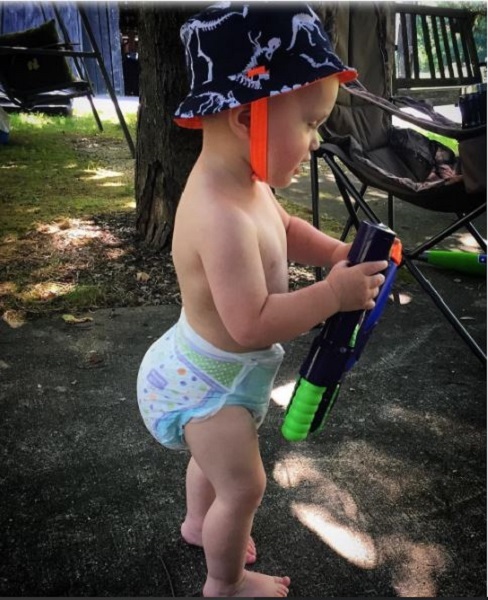 The result is the hilarious pool diaper bottom, which makes it seem as though your baby has a booty a Kardashian would be jealous of. Even diaper companies like Huggies got on top of the trend, using the hashtag #pooldiaperbutt in their advertisements. You’ve got to admit that pool diaper fanny looks pretty funny! Parents will go to great lengths to get their kids to listen to them, and the more creative the better. When kids are young, they’re impressionable, and can’t often tell when you’re being honest and when you’re concocting a completely outrageous lie that no one over the age of 7 could possibly believe. Well, for these kids, their parents set them on a journey that likely ended with a serious existential crisis. The story goes that their parents convinced the two children that they had a third sibling that turned into a mushroom because they didn’t take a bath. 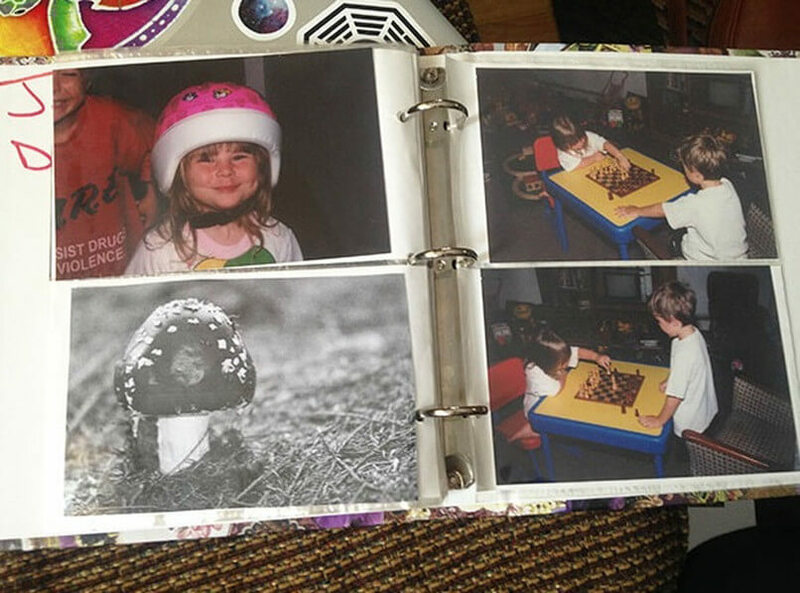 They went as far as to add pictures of this mushroom sibling into the family photo album so their memory would last forever. 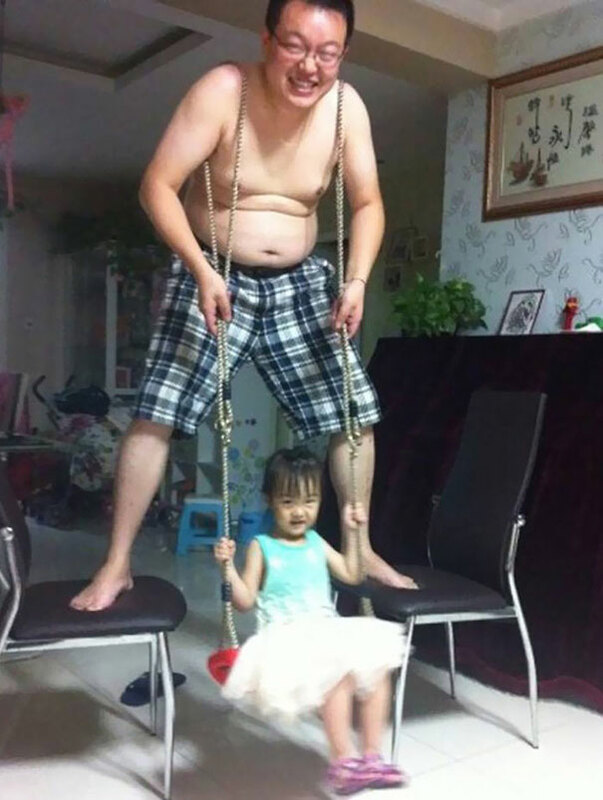 A dad in China turned himself into an impromptu swing, much to the delight of his little girl. He hung two ropes around either arm with a wing connected at the ends, and then positioned himself standing on two folding chairs. The worst thing about this is that those chairs do not look to be the most sturdy, which could end in quite a painful fall for both the dad and daughter. However, the little girl certainly seems to be enjoying herself, as the video shows her falling into a fit of laughter! The dad clearly loves his little girl very much as he was willing to go to great lengths just to hear her laugh. Having a child means having a little subject to test things on. Don’t know what size of watermelon to get for your party? Compare it to the size of your baby. Are you unsure about how cold the pool is? Let your five-year-old jump in a find out. Not too sure exactly what this toy is supposed to be? Well, your child does have a face. Honestly, if this isn’t me as a parent, I don’t even want kids. The whole point of having a kid is to raise them in your image, and if you’re a goof, you’ve got to pass those genes on. Also, does anyone really know what that toy is all about? We’ve all played with one, but who has actually gone about buying it for personal use? We need answers. Sometimes men just have a hard time putting together an outfit, especially for their adorable baby daughter. Mom Brooke Hawley-Basso left baby daughter, Olivia, with her husband Jeremy, who was going to take her to daycare. She didn’t even think twice about leaving him instructions about getting their little girl dressed. When she picked the baby up that day she noticed her outfit was a little, shall we say… different. Dad was apparently unaware that overalls are usually worn with a shirt! 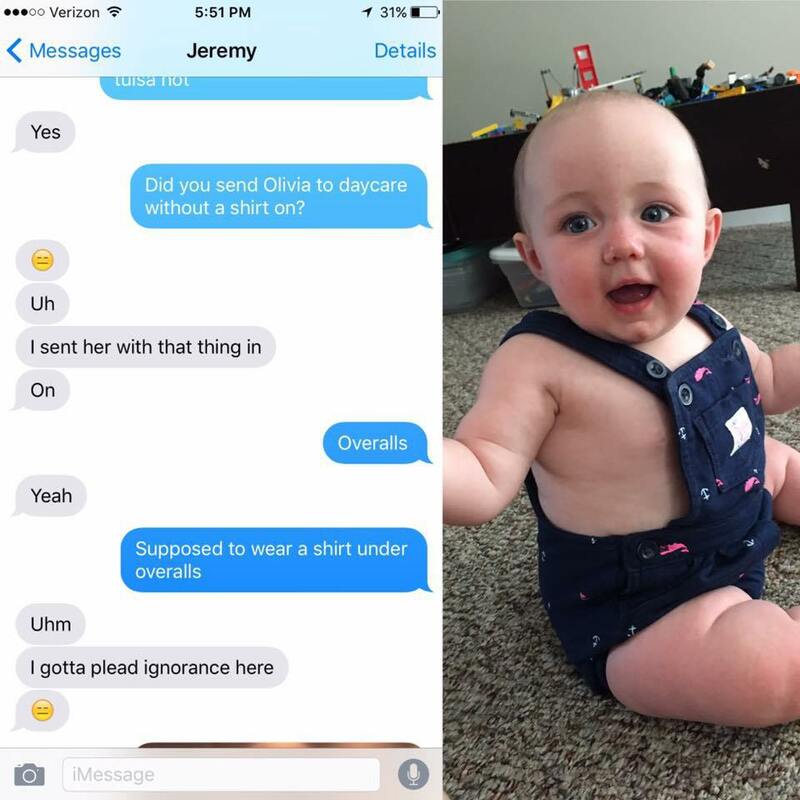 When his wife texted him about it, he said “I gotta plead ignorance here.” Brooke posted the whole thing to Ellen’s Facebook page and the images took off, with moms everywhere sharing similar stories about their own husbands’ baby fashion mishaps. Next: is selfie copying the ultimate revenge? Selfies are a relatively recent invention and definitely loved by the younger generation, so it’s no wonder that the act has been taken over with its very own parenting spin. Take for instance, college student Emily Musson’s parents. 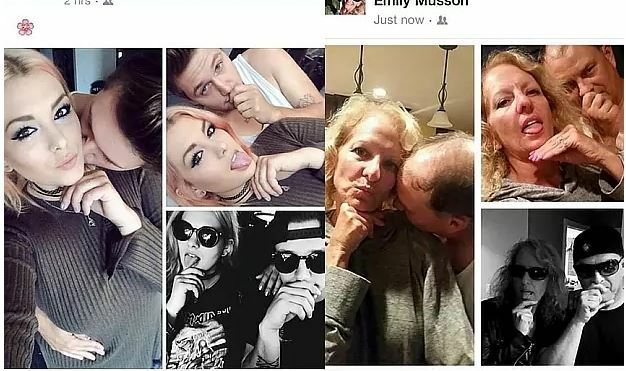 Emily has posted a variety of photos of her and her boyfriend in different poses. One of the major challenges of parenting is dealing with kids who want to grow up too fast. A barber named Russell Frederick was having this very problem with one of his kids, a twelve-year-old son. The boy was behaving badly in school and his father warned him that if he didn’t change his attitude, he was going to be getting the “Benjamin Button Special”, a haircut meant to look like a balding older gentleman. 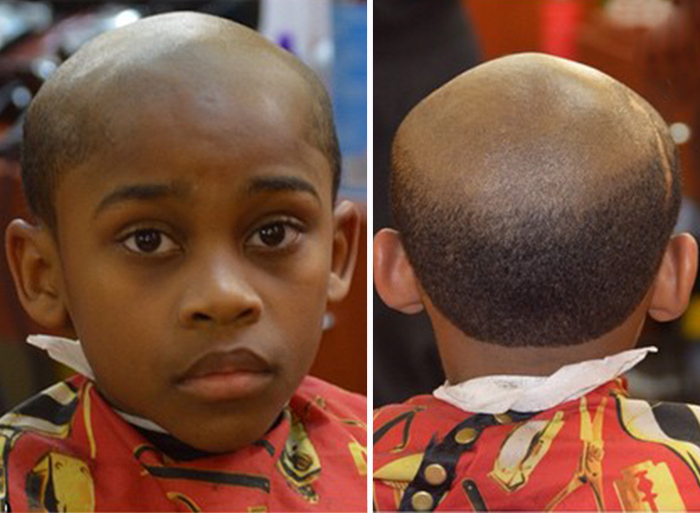 Well, the child kept acting up so his dad gave him the haircut and it quickly went viral. Some parents say this takes things too far, and publicly humiliates the child for their behavior. Other parents agree and say this is a great way to punish kids, unlike corporal punishment that was common in past times. What do you think? After one Australian young lady got caught lying about having sleepovers with her friends to stay at an older boy’s house overnight, her parents were not exactly thrilled. So they decided to punish her by hitting her where it hurts most – right in her little boy crazy heart. Her parents had previously decided to give their daughter tickets to One Direction’s concert. Of course, many tween and teenage girls are absolutely bonkers for the boy band. When this girl was caught in her lie, her parents sold the tickets on eBay with a completely snarky description. Someone came across the ad and posted it on reddit where it went viral. Again, parents around the world debated if her mom was too harsh or not with the punishment. Do you think this next dad went too far? 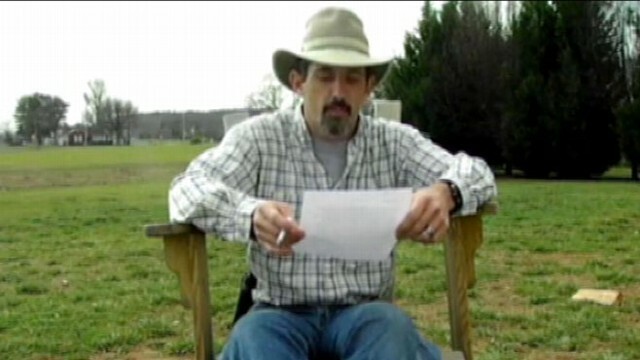 In 2012, Tommy Jordan went viral after he put a video on YouTube where he filmed himself shooting his daughter’s laptop. 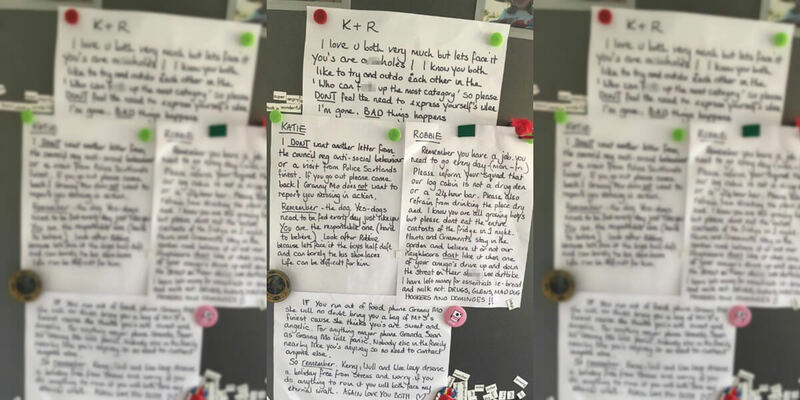 Apparently, his fifteen-year-old has posted some rude comments about her parents and this was her punishment. Much of the internet thought this was way too over-the-top and both the police and Child Protective Services visited the creative dad, although apparently the police only congratulated him on a job well done. Two years later, Tommy spoke to the Huffington Post and said he didn’t regret posting the video. He said he prefers disciplining his daughter in this manner as opposed to other videos he’s seen that have shown parents literally whipping their kids. 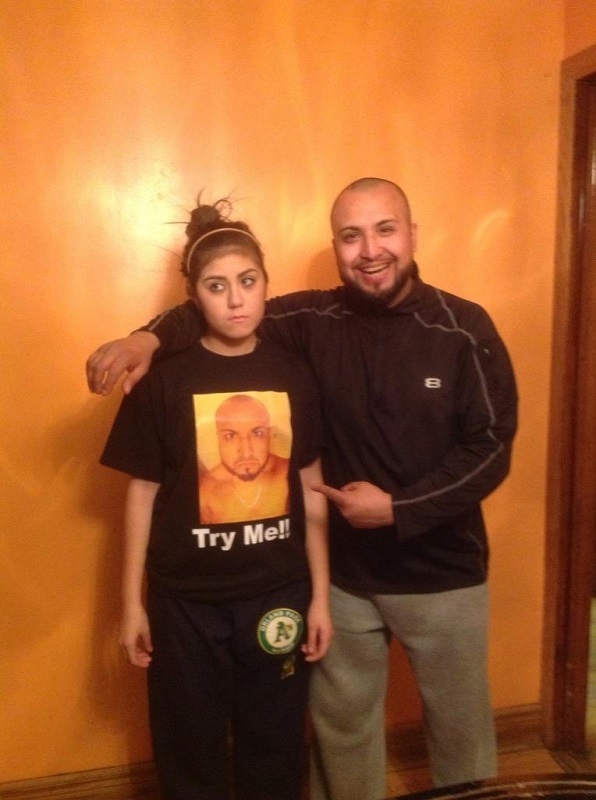 In another round of creative parenting, this dad made his daughter wear a shirt with his angry face emblazoned on it. The image was originally posted to reddit, with the caption stating that this was his friend’s way of punishing his teenage daughter. Apparently, the teen stayed out past curfew several times so the dad decided to force her to wear this shirt to school. While this is funny, the girl probably changed her shirt as soon as she made it school, don’t you think? Many on the internet didn’t think this was a great way to punish the girl as it’s just another form of public humiliation. Per the Huffington Post, some experts claim the public humiliation route can actually cause more harm than good. 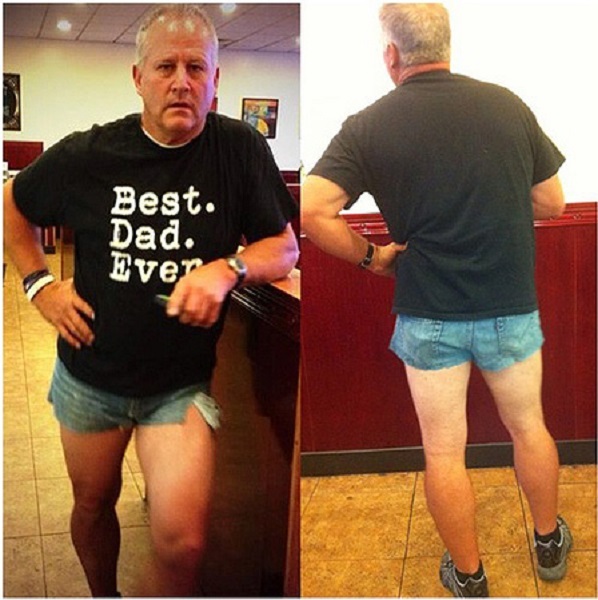 After dad Scott Mackintosh overheard his wife ask their daughter to change into longer shorts before leaving to dinner and their daughter’s refusal, he took matters into his own hands. He said that instead of getting into an argument he demonstrated her look on himself. He cut off a pair of jeans into his own short shorts and paired it with a “Best. Dad. Ever.” T-shirt. Since the dance style of “twerking” has crept into the mainstream thanks to the likes of celebrities like Miley Cyrus, girls everywhere have attempted to emulate the style. In California, a mom named Frances Hena caught her eleven year old daughter twerking at a school dance. Yikes, that’s pretty young! In 2016, a video was released of Candace Payne, now known as Chewbacca Mom. In the video she is wearing a Chewbacca mask outside of Kohl’s. The clip soon went viral because of her contagious laughter throughout. Afterward, the masks flew off the shelves. One buyer was Katie Stricker Curtis, who recently gave birth to her first child — a little girl named Jayden Lee. 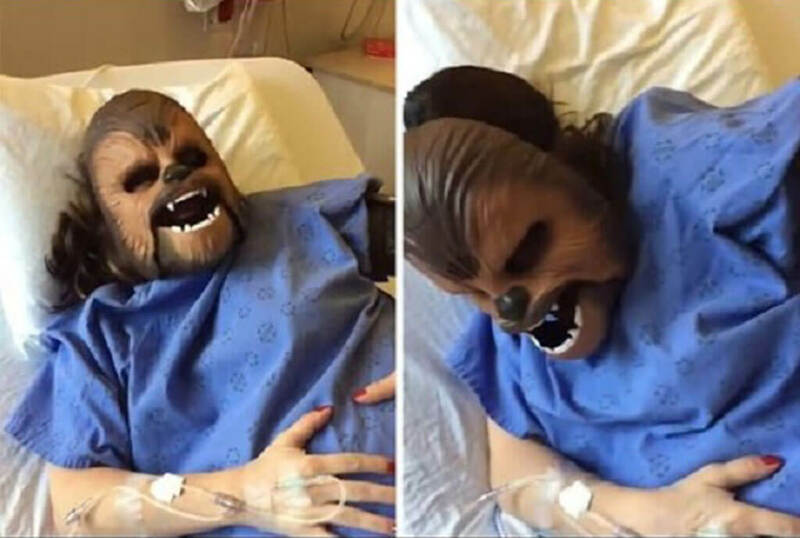 Curtis brought the mask to the hospital with her, and while Katie she is doubled over in pain, the rest of the hospital room (including staff) was probably doubled over for funnier reasons! She posted the video on her Facebook page on January 2nd and the video amassed over 216,00 views. At least Katie dove into the parenting world in a truly hilarious way. Next: celebs get in on the parenting action. 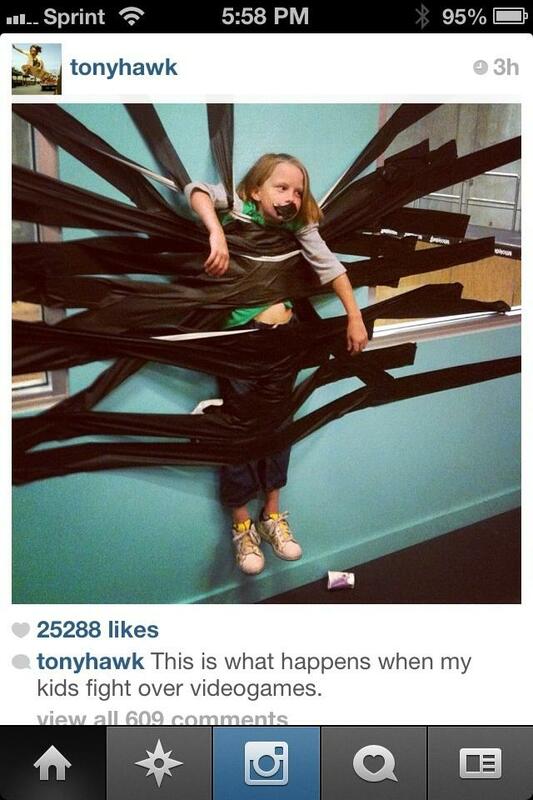 The kid has an array of duct tape around them as he dangles from the wall, and there’s even more across his mouth. Apparently two parents in Nebraska were arrested for child abuse after posting a similar photo to Facebook of their toddler taped to the wall. 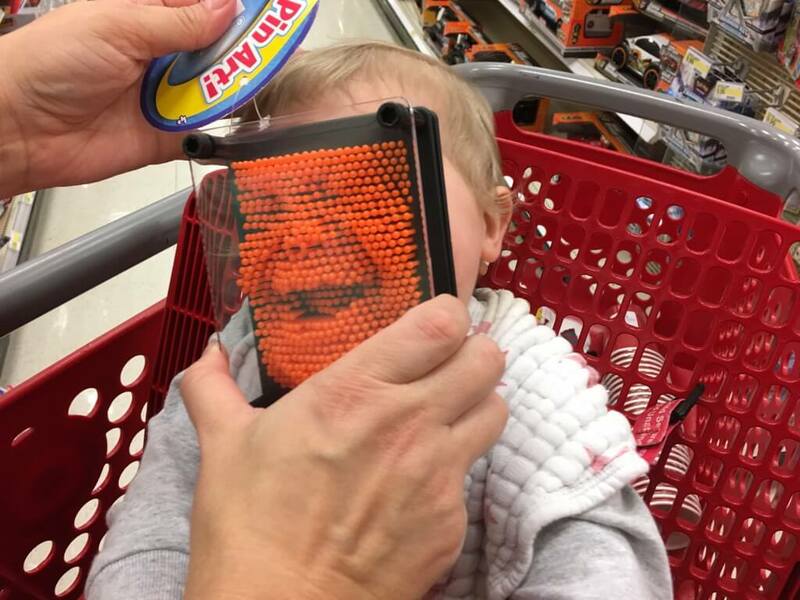 Tony might want to be careful about the next parenting photos he posts, even if it’s a joke. 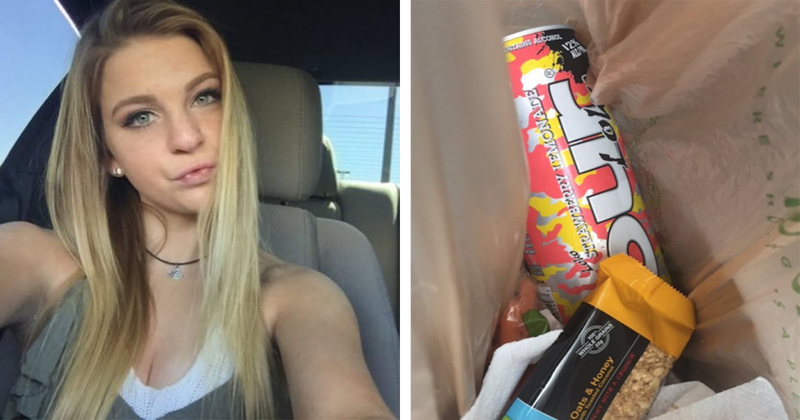 Apparently, the mom was half asleep when packing her daughter’s lunch and didn’t realize she had grabbed one of her twenty-three-year-old son’s alcoholic beverages. Good thing Mckenzie is an honest girl or that could have let to some very horrible consequences for both mother and daughter! In 2016, young aunt Lauren Rincon left her makeup in the reach of her niece Kaitlyn and did not anticipate what would happen next. 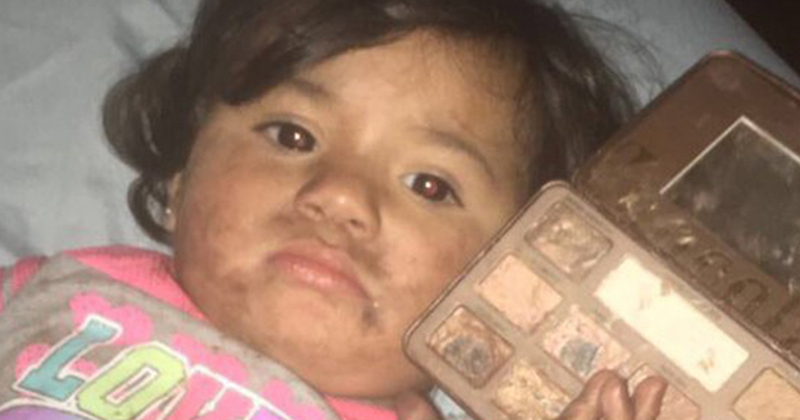 The toddler mistook her Too Faced eyeshadow palette for a delicious box of chocolates and decided to chow down. To be fair, the eyeshadow palette is called the “chocolate palette”, and it actually smells just like the delicious candy treat. She posted her niece’s eye shadow-covered face on Twitter, and it took off. Many of the responders said they had a brother or child do the exact same thing! Maybe makeup lines shouldn’t release food-inspired products! Coming up, meet some dance crashers! This lovely family, the Bagleys, went viral after the two parents (Judd and Kristin) pictured here decided to show up to their fourteen-year-old daughter’s freshman dance. This is probably the worst event ever that a parent could show up at, a new freshmen already has the hard time of navigating high school much less doing so with your parental units present. Their poor daughter, Beth, asked her parents not to come and jokingly said, “I hope you guys aren’t chaperoning.” Of course, ten minutes before the end of the night her parents decided to give her a little surprise. Their surprise appearance was met with lots of dramatic teen girl screaming. Just check out that face! 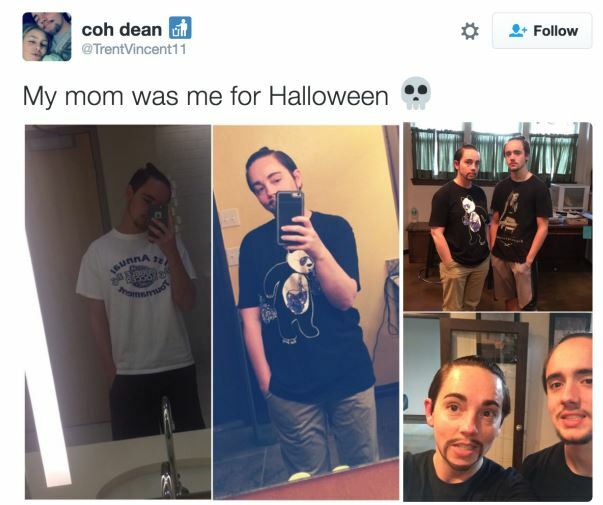 This mom decided to take selfie mocking one step further and actually transformed into her son for Halloween. The most hilarious part about this is the two look so much alike! While some young men might have been mortified that their mother dressed up to look like them, complete with man bun and facial hair, this kid seemed to take it in stride. The young man, named Trent, posted the photos on Twitter and they went viral with parents and teens laughing across the globe! Trent still currently has the tweet pinned on his account and it has now garnered over 80,000 likes. Recently, a forty-eight-year-old man was the unfortunate victim of his elderly father, who decided to get right in the middle of his son’s dating life. Apparently, upset that his son was yet to settle down, Arthur Brooks purchased an ad in an Idaho newspaper. 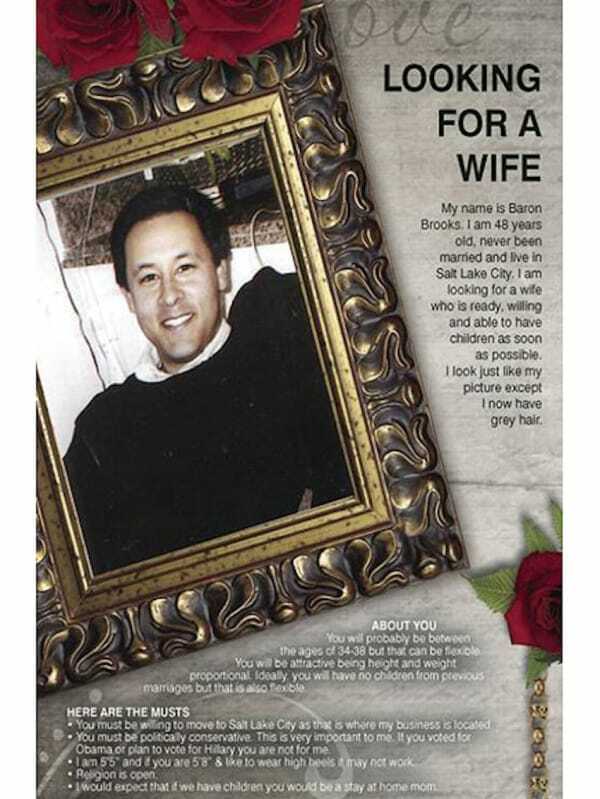 The son, a businessman named Baron Brooks was taken by surprise with the ad. His father was apparently recently diagnosed with congestive heart failure and wanted to see his son settle down. Arthur wanted grandchildren, and pronto! 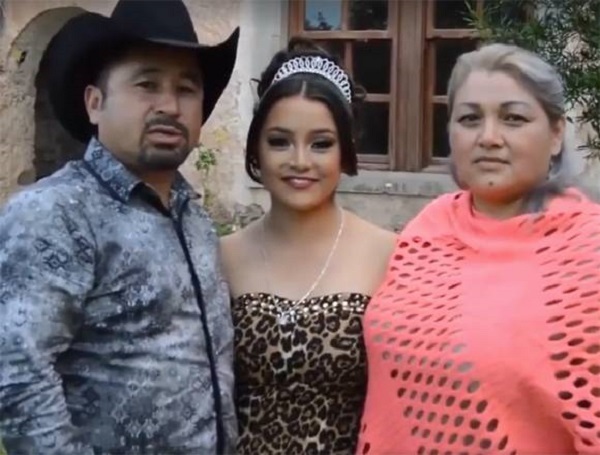 Recently, a young Mexican girl was getting ready to have her traditional 15th birthday party, or quinceañera. The family recorded a video message to serve as the invitation. Over one million people RSVP’d to the invite. After the mistake went viral, her parents reiterated that everyone was welcome to come, yet they obviously weren’t expecting everyone to actually show up. Over twenty thousand people actually ended up coming to the party! Movie star Gael Garcia Bernal even got in on the fun and filmed a spoof of the invite for Mexican television. All of that attention must have been quite overwhelming for a fifteen-year-old girl! While all dads usually embarrass their child at one time for another, this guy seems like he really aspired to take the cake. 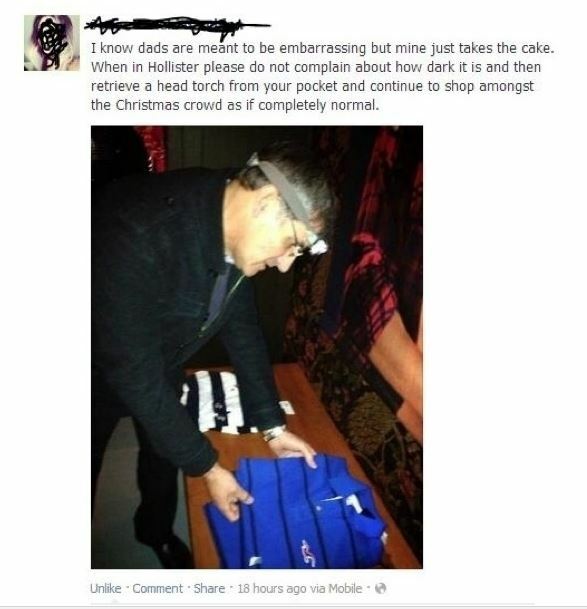 While shopping at Hollister, this dad complained about the darkness of the store and proceeded to retrieve a head lamp from his pocket, put it on his head, and then continued shopping. Surely, his fashionable look drew a few questionable glances but also a few hearty laughs from fellow dads. The majority of those that have commented online have agreed that the store is definitely too dark and they would also enjoy embarrassing their kids in the same harmless manner. Many dad burns have gone viral, especially when they tease their kids over comments they post on Facebook and other social media. This happens a lot when kids pretend to be a little more deep or philosophical then they actually are. Take for instance this kid who waxed philosophical about how much he could learn by staring at the ceiling. The dad replied in true dad manner, burning his kid by asking if he has tried applying the same principle to his textbooks. Ouch! What a burn! Although, you have to admit, Dad has a point! It makes you wonder why he was more willing to stare at the ceiling! We’ve all heard about the story of the family who goes a little overboard over Christmas and decks their halls with all sorts of Santa’s, Snowmen, and of course, the little baby Jesus. He’s kind of a big deal around the holidays. 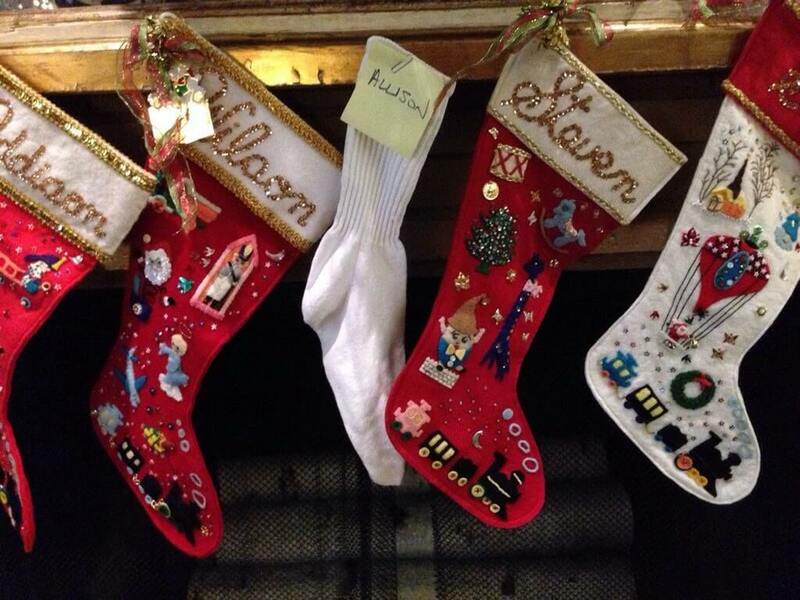 Some families just have a picture of Jesus set up year round. One son saw his chance to see just how devout his parents were and ran with it. These parents were put to the test when their son swapped out their picture of Jesus with that of Ewan McGregor as Obi-Wan Kenobi from the Star Wars series. Apparently, after three months the parents still didn’t notice. Remember that amazing feeling when you finally moved out of your parent’s house? For those of you who haven’t yet, just know that it’s one of the greatest joys a person can experience. That being said, it’s always good to go home for a visit. The only probably is that sometimes, your parent’s can take some time to move on. 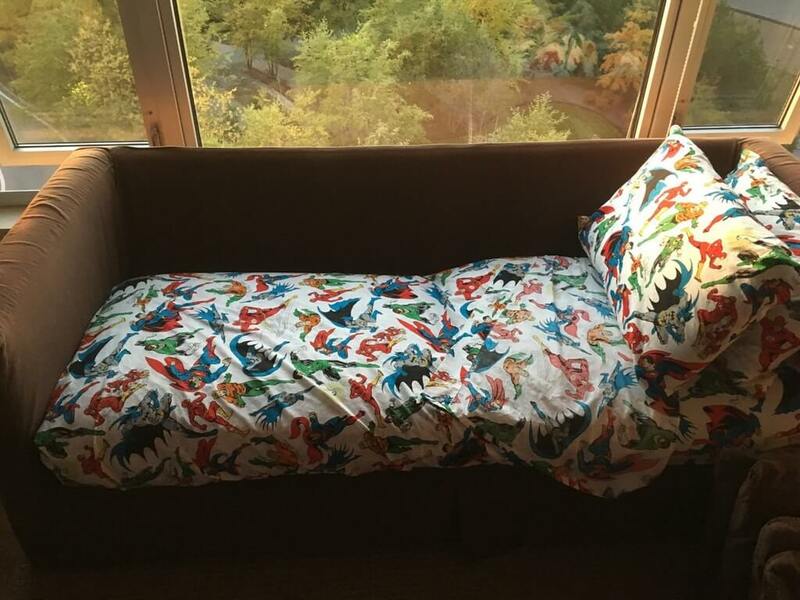 It’s cute and all when your mom leaves your room exactly as you left it when you leave for college and come back 2 months later for Thanksgiving, but it’s entirely different when you’re 27 and your mom still insists on using your childhood bedsheets to make the couch, despite the fact you’re at least two sizes too big. We all have a picky eater story in our lives. Maybe it was a sibling, a family member, or even a friend, but everyone can think of someone in their lives who went to great lengths to avoid any food that wasn’t chicken nuggets. In my life, I’ve probably averaged a peanut butter and jelly sandwich a day, and I’m proud of that. This child’s parents had to get creative to convince them to try new things. If you can’t lie to your child, who can you lie to? I’ve had tofu hidden in my pasta just so my mom could see the look on my face when I couldn’t tell the difference. 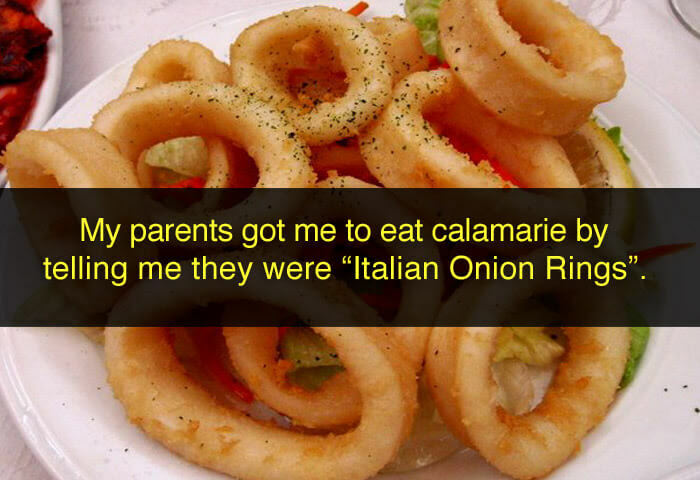 This parent knew what gets their kid’s appetite going, and made sure to feed into it. Get ready, because you’re about to see the look of absolute betrayal. Kids can be demanding, and when they want something, they can throw a real tantrum until they get it. That can mean tears, jeers, and most importantly, the public breakdown where they lie down in the middle of the aisle at Walmart. This little girl has clearly gotten used to getting her way. 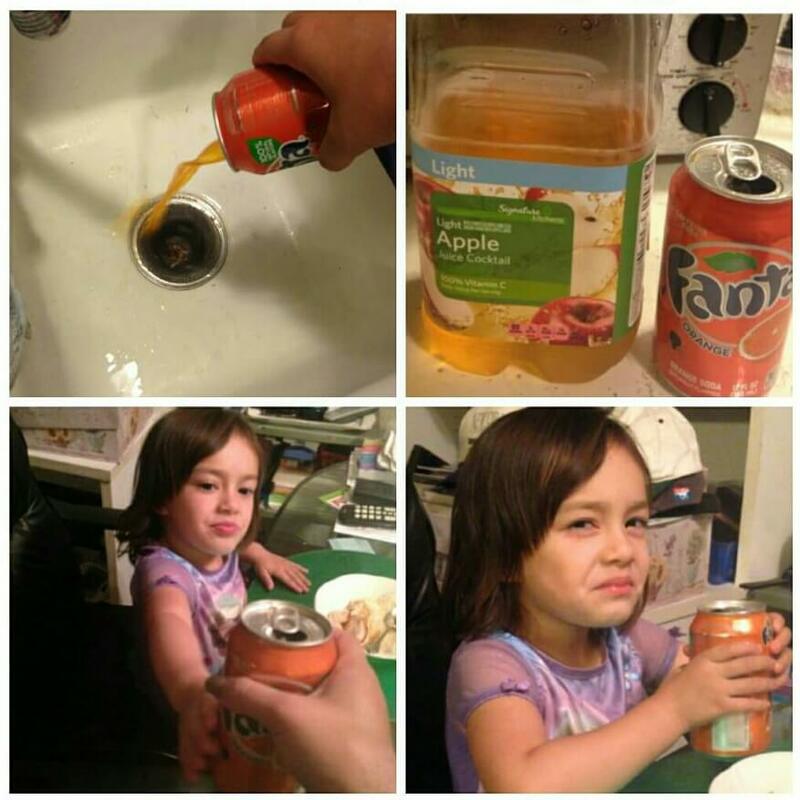 She took that Fanta like it was nothing, like she’s been expecting it all her short life. Well, she’s in for a serious reality check. She’s been bamboozled, and will probably never trust again. Does anyone remember their first themed party? Maybe you were obsessed with spaceships, or maybe it was a cowboy theme. When you’re young, it’s not hard to completely obsess over something. When all you watch is the same cartoon all day every day, your parents tend to take notice. This kid’s obsession is a little more unique than others. Apparently, his favorite thing ever is the commercial for this guy, who is just a simple everyday lawyer from Anytown USA. 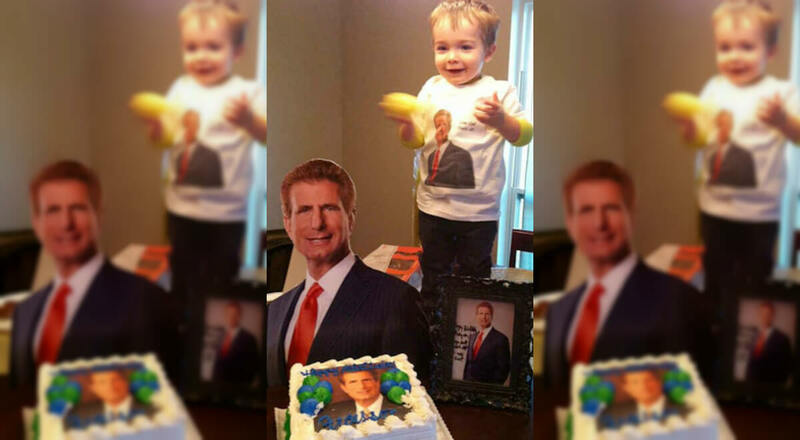 The kid goes crazy for the guy, so his mom just went full out and made the theme of his birthday party all about him. I’m sure there’s some hope that he follows in his hero’s footsteps one day. Selfies have really come to define this current generation. Our cell phones have forfeited the ability to actually be used as a phone in order to ensure we have the ability to take the most perfect pictures right at the touch of a button. Go to any Instagram feed and you’ll see at least one selfie. It’s an epidemic. This couple decided to take the selfie into their wayback playback machine, and grabbed their vintage Polaroid camera and snapped a selfie. 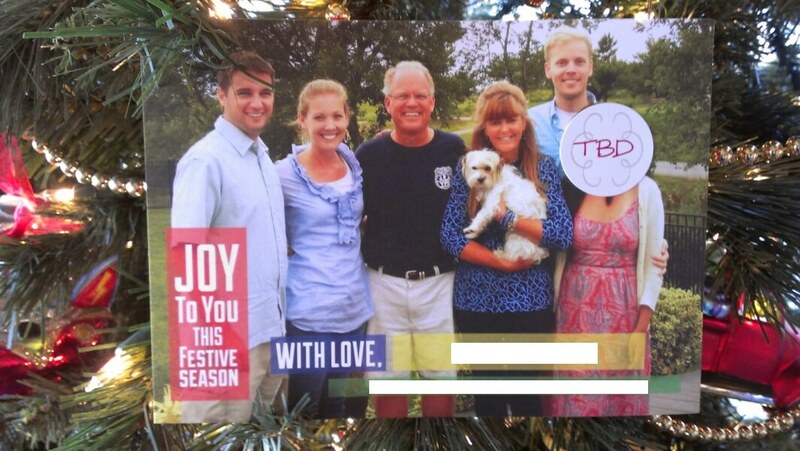 To keep things as retro as possible, they made sure to send their selfie in the mail to all their friends and family. These parents are the definition of goals. Being a parent means teaching your kids some pretty lasting lessons. Some kids can only learn from the mistakes they make, but there are certain life-lessons everyone needs to know. Always wash your hands after using the bathroom, don’t touch the oven, and never challenge someone taller than you to a Lego stacking competition. Her face says it all. Afer a couple weeks of Lego stacking, she got cocky and decided to put her skills to the test. 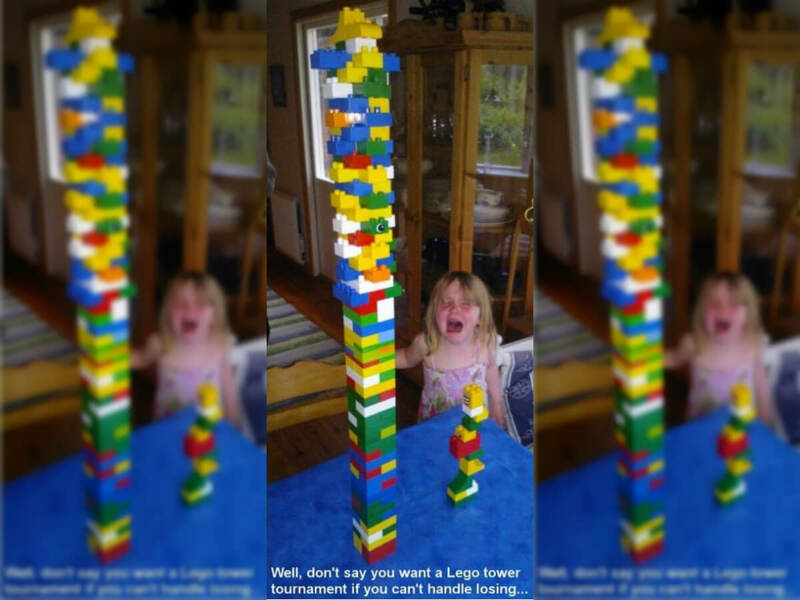 Little did she know that literally everyone has had some experience in the age-old art of Lego stacking, and the biggest advantage a person can have is size. Lesson learned little one. Parents have to lay out all kinds of rules for their kids to live by. Naturally, kids do everything in their power to skirt those lines and bend the rules, usually just to get a rise out of their parents. When your kid finally becomes a teenager, they can start being a real pain and getting them to listen can be a real struggle. The biggest argument in most any household that houses a teenager is curfew. How long do they get to stay out, and more importantly, what happens when they inevitably break curfew. Well, this parent left them a choice. Basically, accept that you messed up and appreciate the fact they were kind enough to give you a blanket. Parents love to say that their children are their biggest accomplishment, but parents also tend to sell themselves short. They put in a ton of time, effort, money, and energy raising a child, but very few end up perfect in the end. Is this really the legacy you want to leave behind? This dad set his sights even higher. Look at his face. That’s the face of a man who’s proud of his work. You don’t get that face when your first born walks across the stage to grab their diploma. 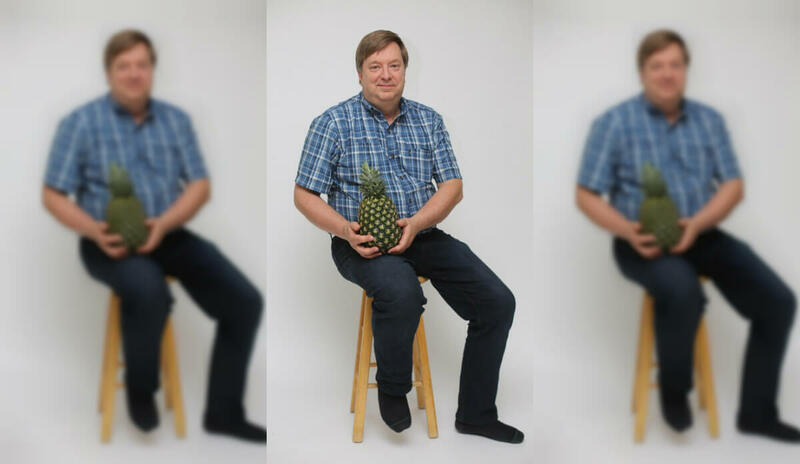 Only a perfectly crafted pineapple can bring that kind of joy out of a person. Meet Allison, the fourth girl your little brother has brought home for Christmas in an attempt to appease your parents. They’ve clearly stopped getting their hopes up though. Give her a couple years to evolve to family status. Being a parent means being there for all your child’s biggest moments. You’ve got to be there for all of their birthdays, sporting events, and dance recitals, and capturing it all on tape so you can relive those memories. Obviously, some of those memories are more interesting than others. I mean, what really happens at your child’s first birthday anyway? All of their friends are probably your friends, and they’ll definitely never remember the moment when they tried to blow out the candles but instead drooled all over the cake. Bu Ghostbusters 2? You don’t want to miss that! When your parents are ragging on you about the latest fad that you swear is who you really are on the inside, just remember that Juggalo’s were, are, and will always be a thing. The Insane Clown Posse were a very real band with a very devout fanbase, and if you were a member, you were a member for life. 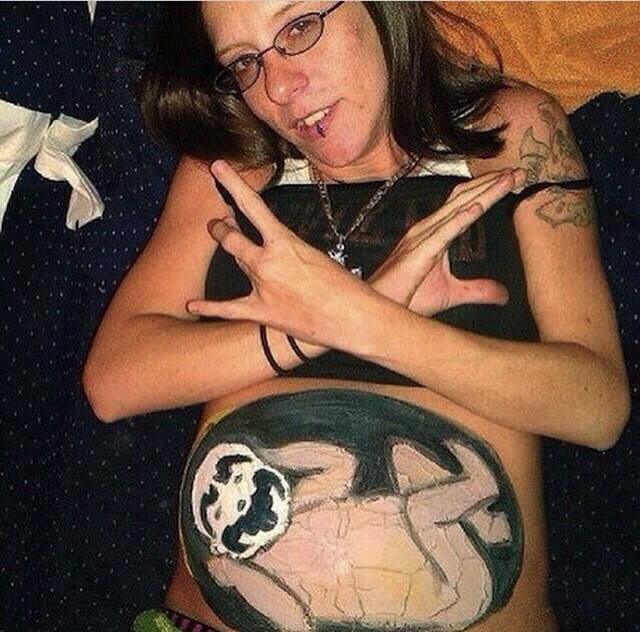 Some parents like to fawn over how their child was conceived, but being two 27 ICP concerts before you were even born is a special kind of achievement. There are high hopes that you will come out of the womb with face paint, and attend your first mosh pit before you can even walk. It’s more than just a following. It’s family. It takes a special type of parent to go on vacation and openly make a fool of themselves for the sake of a perfect picture. When you’re out traveling the world and see the perfect moment, you pretty much have no choice but to take it. While you might scold your child for doing something like this, they’ll understand that it’s actually much funnier to pull off when you’re older. I mean, just look at the childlike look of innocence on their face. A teenager can’t mimic this. This is strictly for the 40+ demographic, and it’s fantastic. Kids make a ton of mistakes, It’s kind of what the growing up process is all about. It’s one thing to be told exactly what to do all the time, but going out on your own and trying new things is important. That being said, there’s a right way and wrong way to try out new things. This is the wrong way to try out new things. For one, you have to be able to use just a bit of math to know that your head might slip in, but it won’t come out. You also have to know that if your parent is egging you own with a camera in their hand, things can only end badly. As your kids get older, you tend to give them a bit more responsibility. They graduate from needing a babysitter to being able to look after themselves for two hours of unsupervised chaos. Then comes the ultimate test — going away for the weekend and leaving them in charge of your house. Few teenagers pass with flying colors. 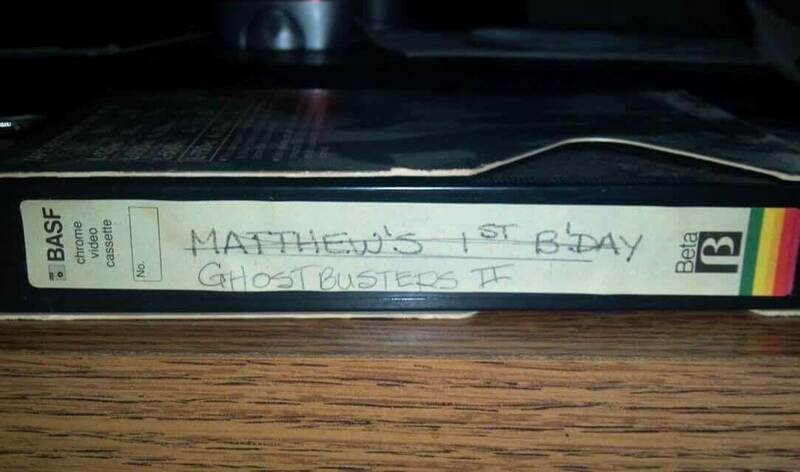 Clearly, these parents are taking no chances. They’ve pretty much mapped out every possible outcome that could happen while away, and left their kids few loopholes to just through. It’s a smart strategy, but in the end, all you can do is hope and pray everything is in one piece when you return. When you become a parent, you give up a part of yourself. You’re no longer just an individual, you’re also “mom” or “dad”. That means putting yourself second for at least the next 18 years of your life. Still, you need to find some time for yourself and remember who you used to be. Every parent should aspire to be like Kim K. It’s hard being a parent and basically always have a child attached to you at every moment. So when you have to take your kid to the bathroom for the fifth time in the last hour and notice it has fantastic lighting, you’d better strike a pose. And if your kid isn’t looking their best, of course you crop them out! This is going to be seen by millions of fans! Listen. Once you have a kid, time and space cease to exist. You have life before children, and the rest. There is no in-between. One day you’ll simply lift your head and realize that 15 years have gone by, and technology has pretty much passed you by. Eventually, your children will be internet savants while you’re struggling to use a remote control. It happens to everyone. 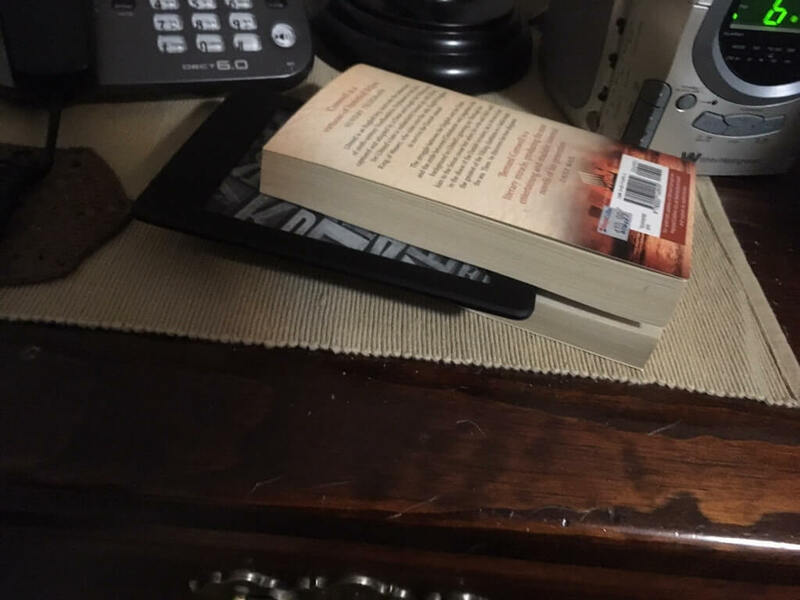 Then one day your kids will gift you a Kindle so you can join everyone in the 21st century, and you’ll give it the old college try, but there’s just something about that paperback charm that keeps you coming back for more. You’re not old, you’re vintage. This is everyone with a kid. 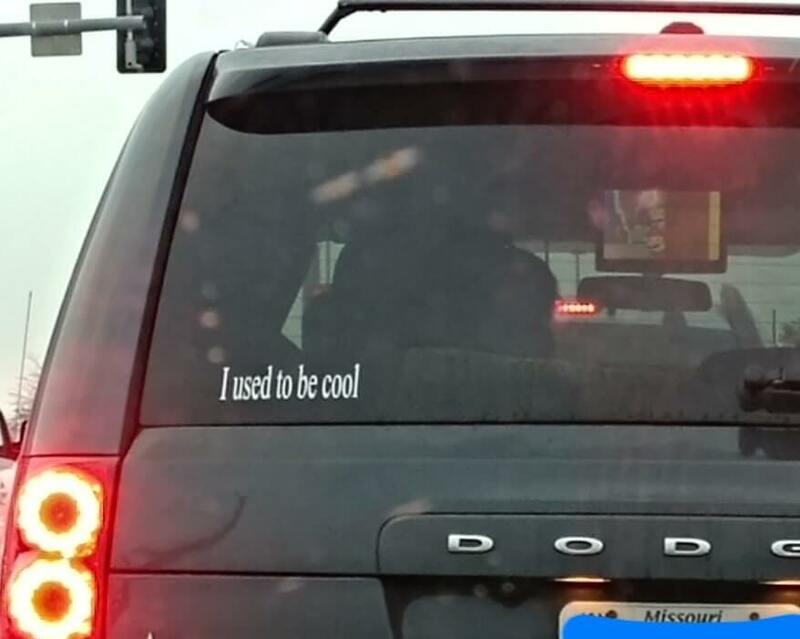 I mean, you must have gotten laid, so you have that going for you, right? When kids are young, they look at their parents like they’re superheroes, but deep down parents know they’ve likely become extremely lame. Whether you like it or not, a minivan just makes sense. It can fit a bunch of kids, groceries, sports equipment, really anything you need. They’re also super affordable, and let’s face it — you’ll be cutting costs. All those hopes and dreams younger you had? Ya, they’re likely gone. Supporting your child can be tough. Whether it’s sports, music, acting, dancing, whatever it might be, sometimes it can be a real struggle. Even if your kid’s a star, the other kids might not be, which can make watching be a real chore. No matter how proud you might be, there’s going to be some lulls in the day. This dad knows how to make the best of things, and isn’t about to let his fellow parents struggle all on their own. By making sure that everyone is properly fed and hydrated, he probably kept at least 15 parents from losing their cool and yelling at a teenager posing as a referee. Meeting your partners’ parents is an intimidating experience, and not all parents will make it easy. Some will confront you, most will terrify you, and apparently, some will have a shirt made up specifically for that first encounter. Most teenage relationships don’t last forever, and seeing a shirt like this at the age of 16 certainly won’t curb those numbers. 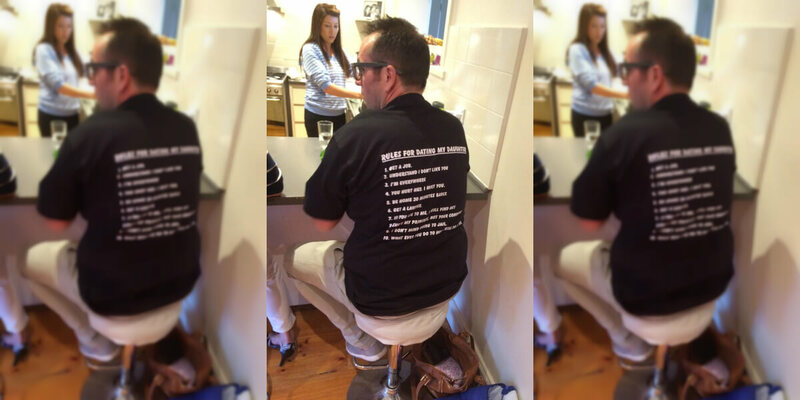 If the shirt isn’t intimidating enough, just look at that power stance he has on that stool. Dad means business, and he has a whole line of questions ready for you to sweat through. Just remain calm, talk with confidence, and do your best not to cry. There’s a time and a place to do an easy knockoff of Dexter, and when your kitchen is being renovated, you pretty much have no choice but to reenact your favorite scenes. It’s not that easy to get your hands on that much shrink wrap, so you have to make the best of it. This couple pretty much screams relationship goals. Not only did they pull this off to perfection, but they made sure to send it off to their children as a prank. I can only assume that this year’s Christmas Cards will have a certain theme to them as well. When it comes to family gatherings, bringing in someone who you’re not totally serious with can be a huge mistake. Not only does your family have to put on a show for their new guest, but there’s also the chance that this is their first and only chance to shine before the relationship goes sour. Taking a big group photo to send out as Christmas cards is usually a great idea… until your son and his girlfriend break up and you’re sitting with 200 cards with a now former family member on it. Luckily, there’s always an answer and your relatives will probably get a big kick out of it. Roller coasters are supposed to be terrifying, but there’s a time and a place to take on your first ride. For these girls, this was not the right time. 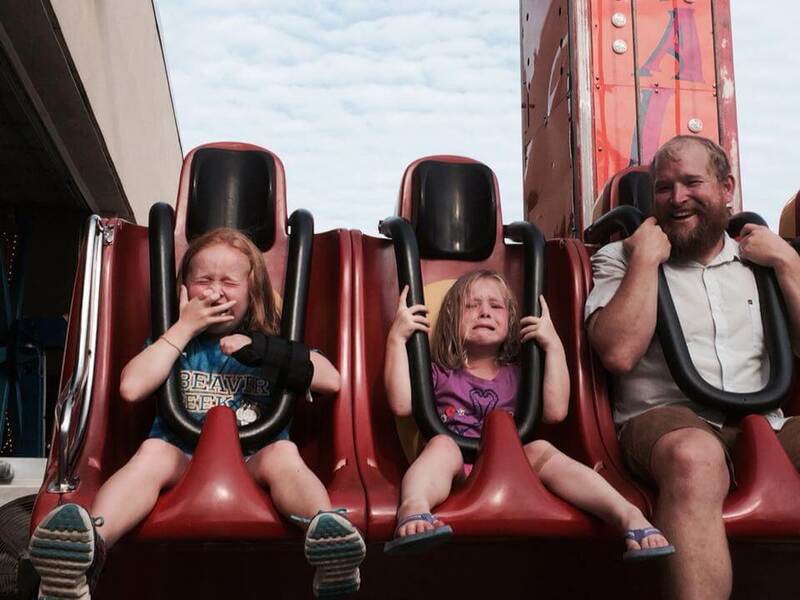 It can take people years to muster up the courage to actually take on a coaster, so there’s no need to rush it… unless your this dad. I don’t know if he tricked them onto the ride or not, but you can instantly tell that they are not ready for this experience. While they’re holding their sour faces in terror, their old man can’t contain his laughter. These are the moment’s parents dream of.